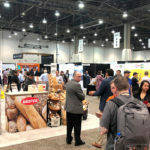 The International Artisan Bakery Expo (IABE) premiere took place March 5-7, 2019 at the Las Vegas Convention Center. 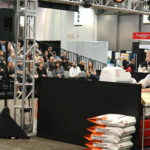 The event hosted seminars, demonstrations, and competitions supporting the artisan bakery movement. 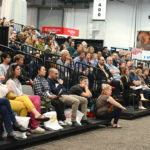 The first edition of the artisan expo was co-located with The International Pizza Expo, the largest pizzeria event in the business. 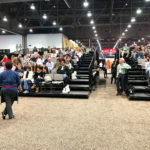 “The feedback was outstanding from both the attendees and the exhibitors,” Pete Lachapelle, Vice President – Food Group, Emerald Expositions, told us in an interview after the show. “Our seminar rooms were packed, many with standing room only. The bleachers (seating for 200) in the demonstration area was 75 – 90% full all day long,” he added. 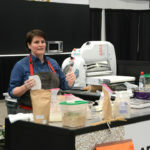 WB: Why was there a need to bring artisan bakers together in a dedicated event? Pete Lachapelle: Over the last six-eight years, the artisan bakery industry has experienced a renaissance of new products and specialty bakeries. 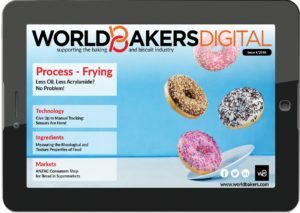 Even intermediate wholesale bakeries are increasing the quality of their products to attract the attention of discerning consumers. The vast majority of these new artisan bakeries are being opened by those beginning a second career. They’ve been encouraged to get into the business by friends, neighbors and spouses, and they bake wonderful products. But when they get into the business, most have difficulty finding the profit. Today, suppliers are reporting 90% of retail bakeries fail inside of 12 months. They need help. They need an annual show where they can network, share ideas and challenges and research the latest techniques, ingredients, equipment and services available to them. On the suppliers’ side, there hasn’t been an annual trade show focused on the needs of their customers for 10 years. They have not had the opportunity to reach the artisan bakery community face-to-face in a setting where everything is about the artisan baker and the products, equipment and services that exists to help them be more efficient and profitable. WB: Please detail the concept behind the International Artisan Bakery Expo – the event’s organization, structure, frequency, attendees. PL: The artisan/retail pizzeria industry in the US has been leading the way for the artisan bakers. International Pizza Expo is an annual trade show which focuses on the independent pizzeria industry. This industry is in many ways a mirror image of the artisan bakery business. Pizza Expo’s floor space and attendance has grown every year for the past 11 years. Because the two industries are so similar, I decided to launch Artisan Bakery Expo alongside Pizza Expo. 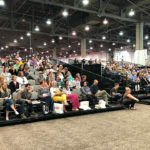 Many of the business seminars and demonstrations we offer each year are completely appropriate for both business owners. Once the attendees entered their assigned entrances, they had access to both shows with nothing more between them than a change in the color of carpet. WB: What categories of exhibitors were present and what innovation would you highlight for each? PL: The combination of Pizza Expo and the inaugural Artisan Bakery Expo had everything an artisan baker needed for their store. 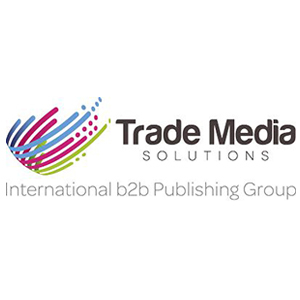 There were approximately 300 suppliers in more than 160 product categories. 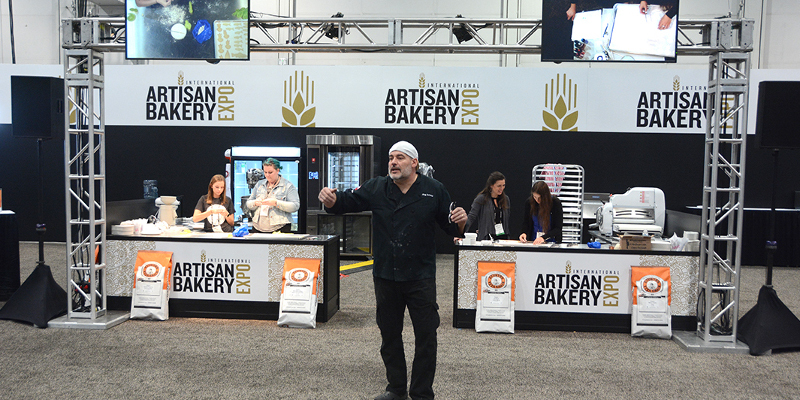 Approximately 50 suppliers representing 75 product categories were represented amongst the vendors on Artisan Bakery Expo’s show floor. A fantastic turn-out for a first-year event! WB: What were the themes of the artisan baking seminars and demonstrations? And which sparked particular interest with visitors? WB: Who were the bakers holding the seminars and demonstrations? PL: The Bread Bakers Guild of America was extremely helpful in lining up 18 of the best bakers in the world. Many were past Coupe de Monde de la Boulangerie team captains, competitors and coaches, others were Food Channel personalities, famous cake decorators. Almost all are artisan bakery owners! WB: How was the international artisan scene represented? What global characteristics could be observed, and what national/regional unique developments? There was a small percentage of international attendees from both Europe and Latin America, though the vast majority were from America. WB: What content/ features are you planning for the following years? We will continue the seminars and demonstrations designed to help artisan bakers find their profit and expose and instruct them on the latest and most popular baked products.